Gros Morne National Park in Newfoundland. 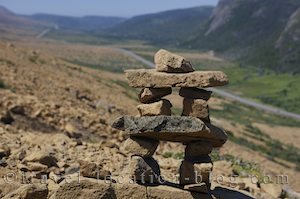 Another glorious bright and sunny day dawned and we were eager to explore the Tablelands - one of the main reasons that Gros Morne National Park was declared a UNESCO World Heritage Site in 1987. After packing up the camper, we set out towards the town of Trout River and watched the 'early risers' from the town as they off-loaded their catch of cod fish and flounder at the harbour. Moving on we drove back along the main road to the start of the Tablelands trail which is a 4km hike (return) from Highway 431. The sun was blazing down by that time so we 'slip, slop, slap, wrapped' for maximum sun protection then headed into the arid Tablelands. The trail is quite rocky in parts although it is an easy enough walk in supportive hiking footwear. After about 20 minutes of walking we came across a beautiful waterfall which cascades over brown/red rocks, so we set up the camera and tripod to capture the image. Upon closer inspection of the rocks that surround the waterfall and river, we could see the patterns and layers on the rocks which are the earth's mantle. The dense silicate rocks which are mainly peridotite, were pushed up from beneath the ocean during a collision between the North American and African continental plates. It is a truly a fascinating place with towering cliffs, a part of the Long Range Mountains, which plateau at their crown like giant steps. This area is well known as an important, natural text book for geologists and give vivid insight into the concept of plate tectonics. On the walk back to the truck, we deviated a little and hiked up a hill which skirts the trail. The view from here overlooked the road which acted like a natural division between the arid, rocky landscape on one side and the lush green hills on the other. After taking in that captivating view, we were finally driven back down the hill to the truck by the annoying biting flies which were relentless that day. Check out Part Two of our blog for July 17, 2007 about the Fleur de Lys Baie Verte Peninsula Newfoundland.